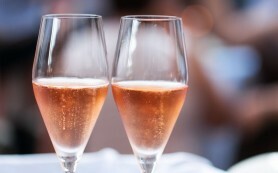 If there was ever a drink made for Valentine’s Day, it must be champagne. And if there was ever an occasion for champagne, it has got to be Valentine’s Day! Just looking at the elegant bottle, with an inviting residue of frost, the beautiful label, and the anticipation of the exploding bubbles makes our spirits and hearts swell with delight - as we know that something special awaits us, and that things might indeed be better than we think, and that they have just gotten a heck of a lot better.